This compact unit, powered by an external 24V DC “wall wart” or battery, provides very high sonic fidelity, no audible noise, and switchable loudness compensation. The maximum output power of this phone amp is 137mW into 300 phones, and 218mW into 32-ohm phones. With the (most excellent; see sidebar) Sennheiser HD 650 300-ohm phones, maximum undistorted SPL is 119dB sine wave, corresponding to about 105-108dB music waveform aver age, which is about the SPL of a large orchestra playing full blast. 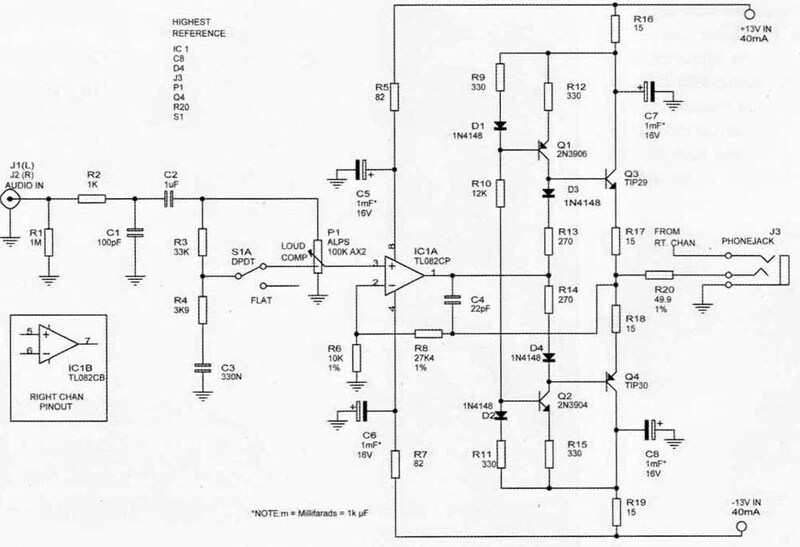 The output stage Q3-Q4, biased by constant-current sources Q1-Q2 (and associated diodes and resistors), is a unity voltage gain power amplifier with a BW (bandwidth) of about 1.5MHz ( Fig. 1). Q3-Q4 bias is about 30mA, enough to ensure Class A operation up to full power with 300-ohm phones. With 32-ohm phones, operation will be class AB at high power, but distortion will still likely be inaudible. But you can obtain full Class A with 32 phones by increasing Q3-Q4 bias to about 120mA, by changing R13, R14 to 1.2k-Ohm This, though, increases the dissipation of Q3 and Q4 from 0.36W to 1.1W, so you should use small TO-220 heatsinks (or insulated chassis heatsinking). Above: Fig. 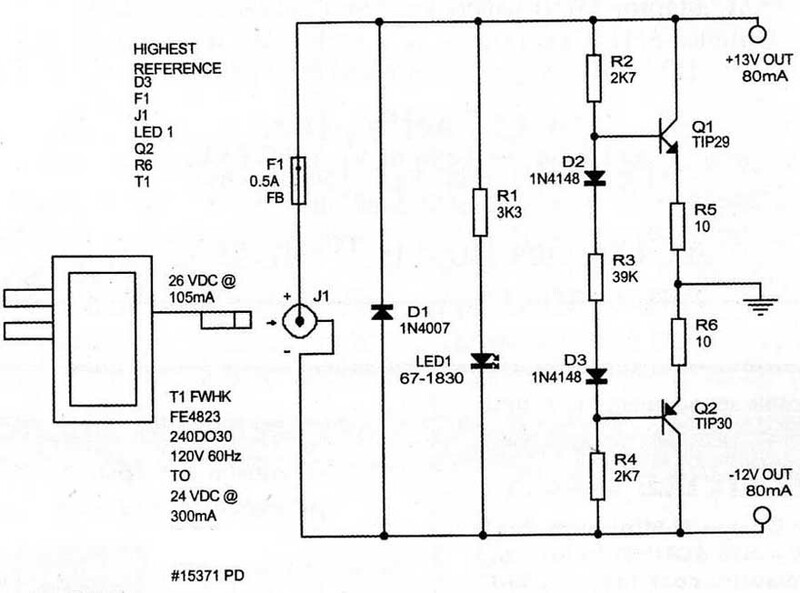 1: Headphone amp schematic (L channel shown). 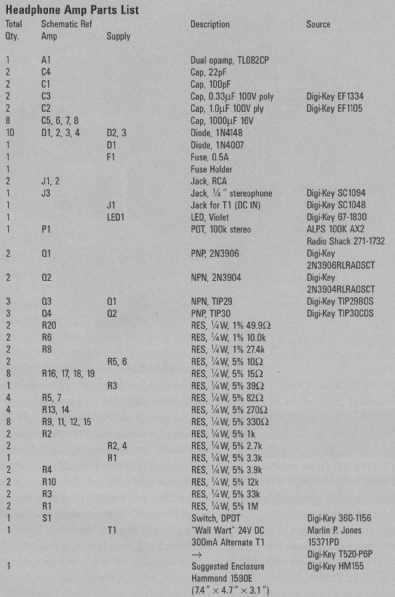 The TL082 input stage has a Class AB output. However, measurements involving supply current monitoring established that the TL082 output bias is 0.62mA, and its operation is Class A up to a load current of about ±1.2mA peak. The application here draws only about ±0.5mA peak, so the TL082 is always in Class A. This, plus a 1.3MHz available BW (reduced to 230kHz by C4), ensures high-purity amplification by the TL082. The (hail per channel) TL082, operating in Class A as described, provides stable gain, low DC offset, and low noise (in audible; about 4dB SPL with the most sensitive phones). Feedback resistors R6, R8 precisely set the gain. C4 applies negative feedback locally around the op amp, above about 230kHz (the -3dB roll- off frequency of the overall amplifier). This cap is not necessary for stability; without C4 the amp’s -3dB bandwidth is 1.26MHz and stable, but this invites AM radio interference, and so on. 1. Output is unconditionally stable — open, short, pure reactance. 2. Output is short- circuit proof. 3. Power delivered to 300-ohm and 32-ohm phones is approximately equal (about 3dB higher with 32-ohm phones, but they tend to be less efficient). But what about “damping factor”? Unlike speakers, whose bass resonance might show a 10x impedance rise, phones have a nearly constant, nearly resistive impedance. 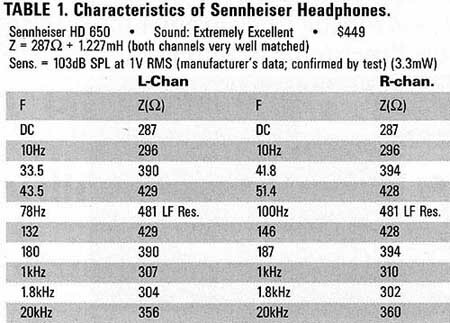 The Sennheiser HD 650 (see Table 1) has a resonance Z of 481-ohm (re 300-ohm nominal). With a 50-ohm amplifier output Z, the signal increase to the phones at their 12 resonance is only 0.5dB. If this concerns you, you can delete H20. But then a clipping signal level into 32-ohm phones could deliver about 2W, blowing the phones and perhaps your ears! To eliminate concerns about AC line pollution, I decided on an external “wall wart” DC supply. The unit specified in Fig. 2 works perfectly and causes no audible hum, or other noise (Photo 4). The circuit comprising Q1, 2 derives a stable voltage that’s very close to the midpoint of the incoming single-ended DC supply voltage. Basically a push-pull Class AB buffer amp, the output (H5-R6 junction) serves as the circuit ground, to which is then referenced the desired bipolar (about ±13V) supply. You could add voltage regulators, but they are not necessary because the amplifier has a very high power supply rejection ratio (PSRR). 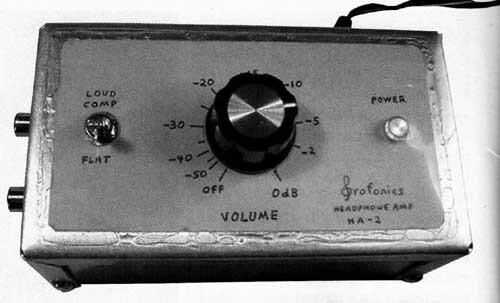 Including regulators would lower the supply voltage, and therefore the amplifier’s maximum output power. 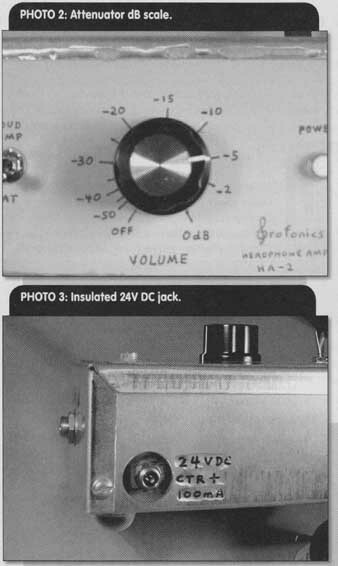 The ALPS 100KAX2 100-kOhm stereo volume control pot ( Fig. 1) is, as of this writing, available at Radio Shack for about $3. This is a bargain—buy all you can. Quality appears to be excellent, and they have a 10% tap which I used for switchable (low) loudness compensation. Of seven units, I measured attenuation tracking (L/B), from 0 to -40dB, to be between about ±0.2dB and ±1dB (this does not depend on full-H matching, but rather on matching of the ratios of wiper-to-ground H to the full H). I suggest purchasing a number of units and selecting for best attenuation tracking. R2 and C1 filter HF interference, such as AM radio stations. C2, the only cap in the audio path, removes any source DC offset that would cause noisy attenuator operation. I used a 1.0uF 100V metal poly cap from Digi-Key (EF1105), 10 for $7.36. Or, you can spend whatever you like on the audiophile cap of your choice. 111 keeps C2 discharged with no input connected. Comparing the HD650 with the Grado RS-2 (both about $450), the Grado had some upper midrange roughness, while the Sennheiser sounded exceptionally smooth and tonally neutral. Above: Fig. 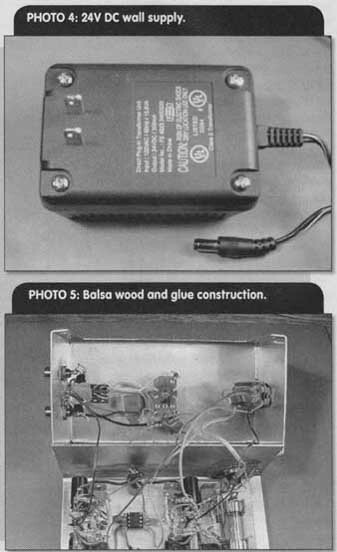 2: Power supply for HA-2 headphone amp. Above: Fig. 3: Loudness compensation responses—attenuator setting 0 to —25dB in 5dB steps. The gain (3.2W/300-ohm phones) is such that at full volume (attenuation at 0dB), a 2.0V RMS input (Red Guide CD 0dBFS = full scale) drives the amp to full power, producing 119dB SPL peaks, and about 107dB average music SPL —about that of a large orchestra playing full-blast—on the Sennheiser HD650 phones. But you can easily change the gain (with R6); the circuit maintains stability and adequate HF response over a gain range of at least 1 to 10. When S1 activates this, R3, R4, and C3 provide the LF boosts versus attenuation shown in Fig. 3. Maximum boost occurs at 20dB attenuation and then stays constant below that level. Down to about -30dB (re full volume), the boost nicely compensates the loss in LF hearing sensitivity (Fletcher-Munson con tours) from i0OdB SPL down to 70dB SPL, within about 2dB to 20Hz. The compensation is not adequate for much lower than 70dB SPL, but with good headphones why listen at lower volume? Unlike many attempts at such compensation, that used here does not sound “boomy” or “muddy.” With a maximum boost of only 3dB at 100Hz, 7dB at 36Hz, and that only at and below -20dB volume, the compensation simply maintains natural bass fullness as the volume is decreased. Note: If you use the ALPS 100k AX2 pot, you can use Photo 2 as a calibrated dB template. These pots are very unit- to-unit consistent regarding attenuation versus rotation angle. Don’t do what I did—I (barely) stuffed everything into a 5 1/8” x 2 7/8” x 2 1/8” aluminum “Bud Box Clone” from Radio Shack (Photo 5). Fabricating a PC board, as opposed to the “rat’s nest on balsa wood, lots of glue” construction I used, might save space, but I think the enclosure should be at least 6” x 3” x 3” in size*. The DC supply input jack must be insulated from the metal enclosure. As Photo 3 shows, I cut a 3/4” hole (with a Greenlee chassis punch—very precise and burr-free), then mounted over the hole a piece of the schematics; I used OHS (on-hand thick plastic, on which the DC jack was mounted. I didn’t use any shielded cables for the audio input paths, hence the 20kHz crosstalk of -66dB (not that anyone would notice it). But coax cable input connections would certainly improve 20kHz crosstalk, if only for the sake of impressive numbers. 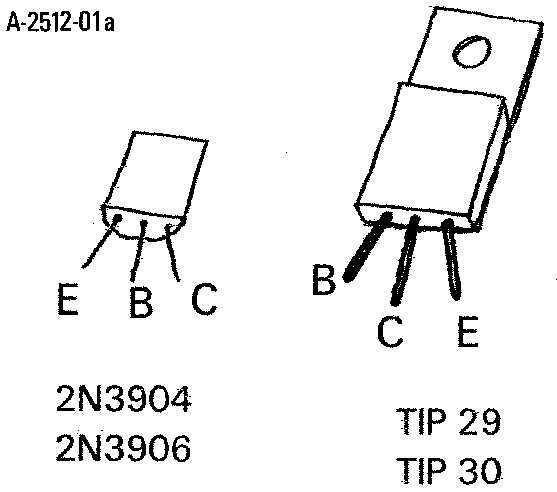 Regarding Photo 5, I didn’t use the transistor types specified in stock) types, similar enough to those specified. The circuit is very insensitive to transistor parameters (I’ve verified this by trying very different transistors; no noticeable degradation). You can connect a second 50 resistor to the R17/R18/R20 junction to drive a second output. If driving two pairs of 300Q phones, the output stage Q3-Q4 will go into Class AB above about half the full voltage output. I’ve found that such Class AB loading appears clean (no visible crossover distortion nor obvious sonic anomalies). But you can achieve full Class A operation with two pairs of 300-ohm phones by increasing the bias to 6OmA (change R13, R14 to 560-ohm). Small heatsinks on Q3, Q4 may or may not be needed; if Q3, Q4 are not too hot to touch, they’ll be fine. 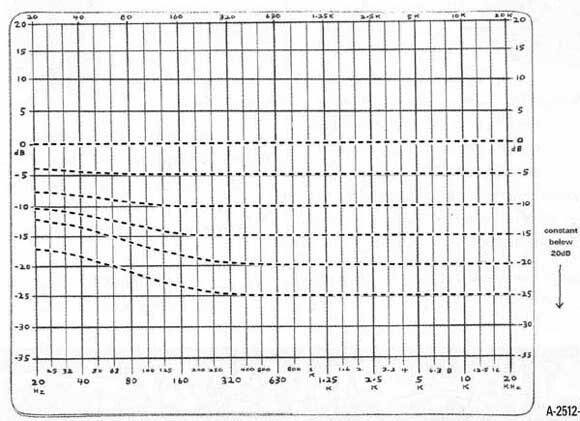 TABLE 2 HA-2 Headphone Amp Measurements. At maximum gain, 0dBFS 2.0V RMS (Red Guide CD Full Scale Signal) drives amplifier to full output. Noise level with Sennheiser HD650 phones: 4dB SPI (maximum with attenuation at -6dB); 1dB SPL with attenuation at 0dB. Output OC Offset: +21mV (left), 19.7mV (right), 300-ohm load 0.9mV (left), +8.GmV (right), 32 load. Is $450 expensive for headphones? Well, to quote the Chuck Mangione song title, “Compared To What?” Most audiophiles wouldn’t blink at spending $450 for a good pair of speakers, especially if they were almost ruler flat from 20Hz to 20kHz, could produce 120dB SPL, and reproduced clean 16Hz at 100dB SPL. Not on this planet for $450! But these headphones do all of the above, plus they have razor- sharp, time-adjusted, pristine transient response (not to ion the obvious freedom from room acoustics). Tonal reproduction is effortlessly and extremely natural, “Coloration” doesn’t appear to be in these phones’ vocabulary. As wonderful as this is, there’s something beyond, difficult to describe, when these phones are driven by a highly transparent, sonically noiseless amplifier, fed directly from a player, particularly an SACD or DVD-A unit: You will be repeatedly startled into instinctively looking around as you hear quiet but clearly-revealed background noises, such as the conductor’s footsteps, musicians’ motions, distant glasses clinking, and everyone breathing. Every subtle sonic nuance produced by the instruments is revealed with crystal clarity. If an unexpected, well-recorded xylophone is played, For example, you’ll swear the resonating metal is right in front of you—downright spooky. Table 2 summarizes the measurements. I don’t have a distortion analyzer, but THD up to just below clipping is probably no more than the 0.004% typical of the TL082 (that figure is with its output stage Class AB loaded; here everything is Class A). Figure 4 shows square-wave responses (20Hz, 1kHz, 20kHz) while driving the HD650 phones to 109dB SPL, and also with no load. The 20Hz exponential decay, and the 20kHz exponential rise time, reflect the -3dB bandwidth of 3.3Hz to 230kHz. Above: Fig. 4: Square-wove responses; phones = Sennheiser HD650 (300 ohm); SPL = 109dB. I compared various SACDs (1) with the HD650 phones directly connected to the player output (the 300-ohm phone impedance and high sensitivity allow that) and (2) with the head phone amp inserted into the path (loudness compensation off, volume control set to match the direct connection). I heard no difference. Some might prefer a headphone amp that imparts a pleasing (euphonic) “sound”—warm, “romantic,” and so on—but this unit isn’t one of them. If the recording has natural warmth, you’ll hear it clearly (with good headphones). * The Hammond 1590 E aluminum enclosure, 7.4” x 4.7” x 3,1”, Digi-Key HM155, is a good choice. Headphone Amp Parts List: Total Qty. ; Schematic; Ref. Amp; Supply; Description; Source.